Gingival (Gum) enlargement, also known as gingival hyperplasia or hypertrophy, is an abnormal overgrowth of gingival tissues. There are several causes of gingival enlargement and they can be grouped into four categories: 1) inflammatory gingival enlargement, 2) medication-induced gingival enlargement, 3) hereditary gingival fibromatosis, and 4) systemic causes of gingival enlargement. The gingival enlargement observed may be localized or generalized and is an inflammatory response that occurs when plaque (collection of food debris and bacteria) accumulates on the teeth. 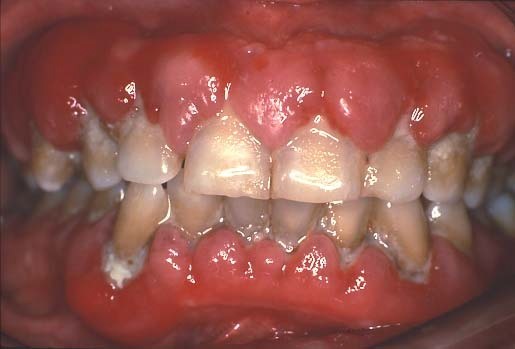 This is a result of the patient not accomplishing effective oral hygiene. An example is noted to the right. 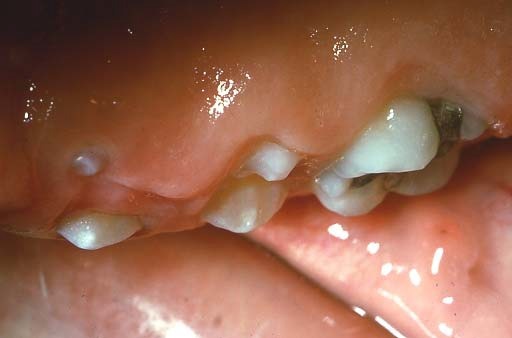 Gums affected by this condition are often tender, soft, red, and bleed easily. Fortunately, this condition usually resolves with effective oral hygiene practices (tooth brushing, flossing) to remove the plaque and irritants on the teeth. Patients who take certain medications may develop gingival enlargement. 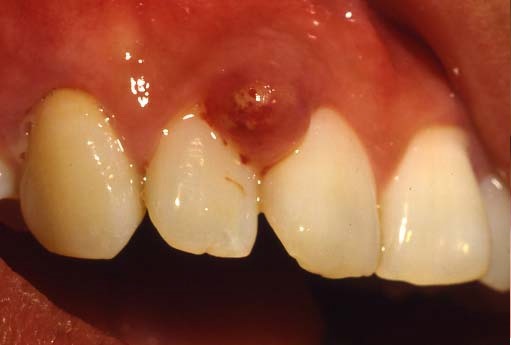 In contrast to inflammatory gingival enlargement, the gum tissues in such cases are typically firm, non-tender, pale pink in color, and do not bleed easily. To the right is an example caused by the cardiovascular drug nifedipine. In severe cases, the gingiva may completely cover the crowns of the teeth causing periodontal (gum) disease (due to difficulty in keeping the teeth clean) as well as problems with tooth eruption and alignment. Medication-induced gingival enlargement may resolve either partially or completely when the medication is discontinued. If the medication cannot be discontinued, surgical removal of the excess gingiva (gingivectomy) may be performed but the condition will likely recur. As this condition is somewhat worsen by the level of plaque accumulation on the teeth, effective oral hygiene measures will reduce the severity. This is a rare hereditary condition that usually develops during childhood, although some cases may not become evident until adulthood. The condition presents as a slowgrowing generalized or occasionally localized non-tender, firm, pale pink enlargement of the gingival. The example to the right reveals how the teeth may become covered by the exuberant gingival overgrowth. Surgical removal of excess gingival is often necessary to avoid impaction and displacement of teeth. Repeated surgical removals may be required because of the recurrent nature of this condition. There are numerous physiologic and systemic conditions that may promote localized and/or generalized gingival enlargement such as pregnancy, hormonal imbalances, and leukemia. 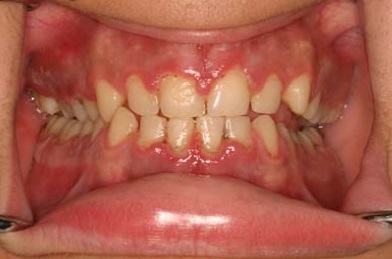 To the right is an example of a localized gingival enlargement associated with pregnancy. Gingival enlargement associated with systemic conditions usually resolves when the underlying condition is treated or in the case of pregnancy, delivery of the child. As with medication-induced gingival enlargement, effective oral hygiene measures will reduce the risk of developing gingival enlargement. Q: What medications can cause gingival enlargement? 1. Phenytoin: an anticonvulsant medication used to treat various types of seizures and convulsions. 2. Cyclosporine: an immunosuppressant medication used to prevent organ rejection after transplant. It may also be utilized in the treatment of a variety of other immune mediated conditions such as psoriasis, atopic dermatitis, rheumatoid arthritis and nephrotic syndrome. 3. Calcium channel blockers: a class of cardiovascular drugs used in the management of conditions such as hypertension, chest pains and irregular heartbeats. Commonly prescribed examples include nifedipine, amlodipine and verapamil. Q: What are my chances of developing gingival enlargement if I am taking one of the above-mentioned medications? A: The likelihood of medication-induced gingival enlargement associated with long-term phenytoin use is estimated at 50%. For cyclosporine the prevalence is about 25-30% in adults (higher in children ≈ >70%). For calcium channel blockers, the prevalence ranges greatly (15-85%) depending on the type of calcium channel blocker; the risk of gingival enlargement appears to be the hightest with nifedipine (6-15%). Q: Is gingival enlargement associated with the dose of my medication? A: The dose of the medication appears to be less of an issue than having good oral hygiene (less plaque present on your teeth). Q. What should I do if I notice my gums are enlarged? A: You should schedule an appointment with your dentist for an evaluation. Most cases of gingival enlargement are readily explained after the dentist takes a thorough medical history and performs an oral examination. In rare cases, further tests such as blood studies or a biopsy may be necessary to determine the exact cause of your gingival enlargement. Q: Is gingival enlargement contagious? A: No, these conditions are not infectious. You did not catch it from anyone and cannot pass it on. Q: What can I do to reduce the severity of gingival enlargement? A: In general, your ability to practice effective oral hygiene measures on a daily basis helps to reduce the risk of developing gingival enlargement. Your dental team is available to monitor your effectiveness and assist you as necessary. For example, you may need to undergo more frequent professional cleanings or may be instructed on ways to improve your brushing technique. Effective oral hygiene is especially important for managing gingival enlargement caused by chronic inflammation and cyclosporine. For medication-induced gingival enlargement, your physician may be able to substitute the medication to reduce your risk of developing gingival enlargement. For gingival enlargement associated with a systemic condition, management of the underlying systemic condition usually results in partial or complete resolution of gingival enlargement.